A lot of PDAs have had a SD memory slot, and now most SD slots are SDIO. In other words you can put I/O devices into them rather than just memory. GlobalSat showed us the world's first SDIO GPS receiver back in March at the CeBIT exhibition in Hannover. This has completed its testing and has been on the market for a short while now. 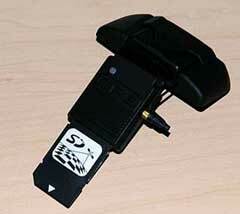 The receiver was provided for review by the UK GlobalSat distributors Easy Devices. The price (at time of writing) is £85.00. 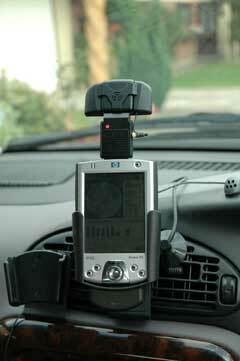 The SD501 GPS has been tested by us in both an XDA2 and an iPAQ 2210, both of which have SDIO capabilities. My first impression was that it is very sensitive. This was borne out by the fact that I managed to get a 7 satellite fix in the centre of my house. 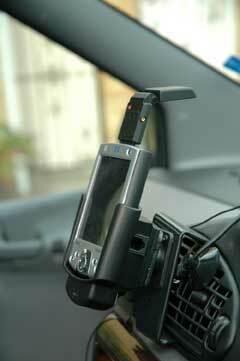 It was later discovered that the GPS was an SiRF Xtrac device. There is a little confusion over which version of Xtrac the GPS is running 1 or 2. According to Easy Devices the UK distributor some of Compact Flash and Bluetooth GlobalSat GPS receivers are now shipping with Xtrac and there is an option of Xtrac or non Xtrac. The review sample arrived in a retail box containing the SDIO GPS, a Booster Aerial, and a CD containing documentation, software and drivers. Listed Below are the Features, Compatibility, and Specifications as provided by the manufacturers, GlobalSat. 9.Unique and patent-pending booster for improving acquisition sensitivity, especially for PDA with WLAN device. PS. Devices above have been tested and compatible with SD-501.Basically, if the Wince Device with SDIO port and adopt the Bsquare SDIO NOW! would be compatible. 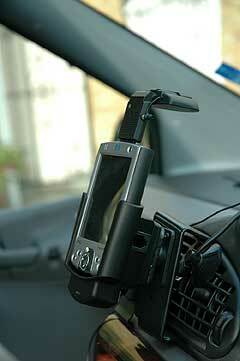 The GPS measures about 1.25 inches x 3.25 inches (30mm x 80mm) when inserted in the PDA with the antenna fully opened. As this can be set at any angle from 0 to 180 (folded) the length can reduce to just under 2 inches (50mm). The pictures below show the system mounted in my car. 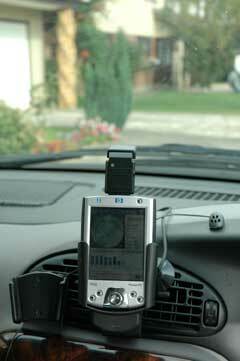 This shows the relative size of the GPS when compared to the iPAQ 2210. 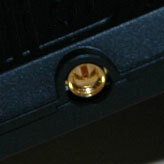 You can also see the hinge on the antenna, allowing it to be set to just about any angle you want. If you look closely at the screen you can see that I have an 8 satellite fix. I have found that by closing the antenna completely the signal is only marginally affected. This will of course vary in different environments, but does make the GPS a bit more compact. On the right hand side of the GPS is an external antenna socket. Globalsat have devised an ingenious little booster aerial which clips over the inbuilt on and connects into the antenna socket. The pictures below show the booster installed. This seemed to give me an additional satellite on my fix, but this is not conclusive. Over the weeks that I have been using the GPS I never really had such a weak signal that I felt it needed to be boosted. You could, of course, connect an external antenna should you have a car which has a coated windscreen. Most PDAs only have a single expansion slot, unless you own a PDA like the iPAQ 2210, which has dual slots, then you will need to store your application data on the internal PDA memory. This can be very restrictive and severely limit the usefulness of the SDIO GPS. You will also need to confirm that your PDA has SDIO functionality and is not just a SD memory machine. I have an XDAII which I used with map data stored on the internal memory, and an iPAQ 2210 with maps stored on a CF card. The SDIO slot on the iPAQ 2210 and XDAII PDAs is located conveniently on the top of the device. This means that when reading the screen the GPS antenna is always pointing in the right direction. My concern about SD cards that stick out from the PDA is the point of weakness at the opening. I tried flexing the GPS (whilst out of the PDA) and the construction seemed to be quite strong. How it would stand up to a serious knock I am not sure, but it did handle quite a lot of pressure without snapping. The next potential problem with the SD technology is that the SD slot does not lock a device in. There is a spring loaded mechanism which is used to eject memory cards, but the SD501 can be simply pulled out without triggering the spring. The obvious test here is to turn the PDA upside down and shake vigorously. I did that and the card did not fall out. You can pull the card out and then when reinserting you have to unlock the spring then lock it again. Interestingly you can remove and replace the SDIO GPS at will without having to reset the PDA or restart the drivers. Different GPS applications will handle the lack of GPS data in different ways, but the hardware and driver interface seems to handle this well. My final concern is only a minor one, but if you are out hiking and get caught in a rain storm, then the SDIO GPS could act as a channel to send rain into the internal areas of the PDA. This is only a minor concern as I would not expect to have my PDA itself exposed in these conditions. Before you can start to use the SDIO GPS you need to install the drivers. Initially this was a big issue for me. The drivers installed correctly, but nothing worked. I tried this in both the iPAQ 2210 and the XDAII and had no joy with either. At first we suspected a faulty unit, and so Easy Devices sent me a replacement. Still nothing. It wasn't until an unfortunate set of circumstances forced me to hard reset my 2210 did the true reason for this come to light. I had some other drivers using the COM7 port which stopped the GlobalSat drivers working. Once that was solved the GPS worked like a dream. When the GPS has power the LED is a solid red. Once a fix has been obtained the LED flashes red. The marketing shows pictures with a green LED. My review sample only had a red one. One thing that I noticed straight away was the sensitivity of the device. The version I received did not have any details on the GlobalSat web site at the time so I only had the details on the box to go from. This just mentioned the SiRF StarII/LP chipset. You can imagine my surprise when I noticed that my 2210 had a seven satellite fix in my equipment shelf. 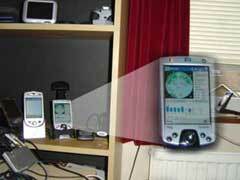 The picture to the right shows the location of the GPS and PDA nearly two feet from the window, in an enclosed cupboard. It later transpired that the GPS has Xtrac technology, it is unclear if it has Xtrac 1 or Xtrac 2 installed, but whatever version it is clearly able to pull in a strong and accurate signal. Moving to the stairwell in the centre of my house which has to be at least 20 feet from the nearest window, with none visible to the GPS. Using the GPS Info utility supplied with the GPS you can see that I was able to still get a seven satellite fix. Absolutely amazing!! Xtrac is a technology developed by SiRF to enhance weak GPS signals and get a location fix where previously this was not possible. This has been the subject of a lot of heated debate both for and against. Interestingly SiRF themselves are very quiet on the subject and do not seem to attempt to refute or confirm any claims. Most of the comments and critisms we hear about Xtrac relate to lag and overrun. Lag is when the GPS reported position is some way behind your actual position. Overrun is where the position keeps moving after you have stopped. In the weeks of testing that I performed on the GPS I never once noticed either Lag or Overrun on my test device. One of the best applications to use to test the accuracy of a GPS is not a Street Routing application, but a raster based one. To the right is a screen capture of a live track you can see that the track follows the road pretty accurately. Towards the top left of the track the road is shown to be a few feet out. This is not a fault in the accuracy of the GPS as it happens with other GPS devices. This would tend to suggest that the map is not 100% accurate. If you use a Street Routing application you will find that it 'snaps' your position to the nearest road within certain tolerances so you wouldn't notice this effect. I have successfully used the SDIO GPS with a number of applications, including TomTom Navigator 3, CoPilot 5, Memory-Map, and Outdoor Navigator. During the review period I did not experience any issues with any of the software/GPS combinations. I was really impressed with the signal strength and accuracy of this device. Once I had sorted out my software conflicts it installed easily and was simple to use. It maintained a strong and accurate fix in all conditions and terrains. I like it's compact size and the low power consumption. I didn't do any analysis on the power usage, but was able to undertake 2 hour hikes using less than 50% of the 2210's battery power. I was a little concerned about the potential weak point where the card meets the body of the PDA, and the lack of proper locking which could cause the GPS to come out under extreme conditions. The main drawback though is the fact that it takes up a memory card slot which will severely restrict the ability to run a lot of data intensive GPS applications. This fact really diminishes it's usability for many potential users.